This idea might be familiar to fans of The Matrix – and at first glance may seem somewhat unbelievable. However, Oxford University Professor Nick Bostrom makes an interesting case using both conditional probability and logic as to why it’s more likely than you might think. Taking the argument step by step, firstly when Bostrom talks about a “posthuman” stage he is referring to an advanced civilisation with significantly greater technological capabilities than we have at present. Such a civilisation would have the ability to run a computer simulation so accurate that it would be indistinguishable from “real life”. Based on the same logic, we have no way of genuinely knowing whether we are really “here” or whether we are nothing but a computer model designed to give the impression that we really exist. Interestingly, the possibility that our individual life, the world around us and indeed everything we know about the universe may be false means that we can never truly claim to have knowledge of anything. I think that most optimists would think that civilisation has the potential to develop into a “posthuman” phase of advanced technology. Indeed, you only need to look at the phenomenal growth in computer power (see Moore’s Law) to have confidence that should we stick around long enough, we will have the computational power possible to run such simulations. So if we optimistically accept that humans will reach a “posthuman” stage, then it’s even easier to accept the second proposition – that if an advanced civilisation is able to run such civilisations they will do. After all human nature is such that we tend to do things just because we can – and in any case running such ancestor simulations would potentially be very beneficial for real world modelling. 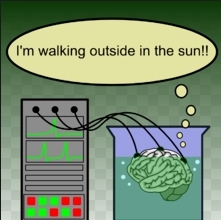 If we do accept both these premises, then this therefore leads to the argument that we are almost certainly living in a computer simulation. Why? Well, an advanced civilisation with the computational power to run ancestor simulations would likely run a large number of them – and if there is only one real world, then our experience of a world is likely to be one of these simulations. As a ToK topic this is a fantastic introduction to epistemological questions about the limits of knowledge and questions of existence, and is a really good example of the power of logic and mathematics to reveal possibilities about the world outside our usual bounds of thinking. Imagining the 4th Dimension – How mathematics can help us explore the notion that there may be more than 3 spatial dimensions. Is Maths Invented or Discovered? – A discussion about some of the basic philosophical questions that arise in mathematics.